Atradius attends the Seafood Expo in Boston and meets with prospects, clients and strategic brokers. Sector experts comment on the trends of the seafood industry. 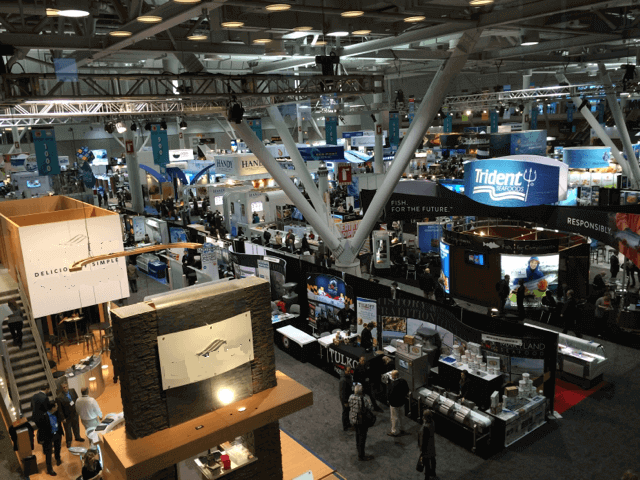 Atradius was present at the Seafood Expo North America 2016 in Boston on March 7-8 to meet with clients, prospects and to stay on top of the latest trends in the seafood industry. This annual exposition is the largest seafood event in North America. The event attracts over 20,600 buyers and suppliers of fresh, frozen, and value-added seafood products, equipment and services. Attendees come from more than 100 countries to do business here. Atradius Senior Risk Underwriter for the food sector, Sharon Benfer, notes how traceability and proper labeling of products has been an ever growing trend for the seafood industry over the past few years. “Due to increased regulations regarding traceability, companies need to meet compliance standards. To do so, they typically have to make significant investments in their packaging and labeling and also in their processing systems. While large companies have the capacity to absorb these costs, some small and medium businesses could feel greater affects to their overall cost of doing business and profitability. Recalls can have a vast effect on small to medium businesses if the recall is widespread. Compliance is not an option, and these businesses have no choice but to comply. There are many government agencies and private companies who are attempting to address the problem of affordable compliance systems. This isn’t a new concept, companies have had to comply with traceability standards for years; the difference today is that consumers want to be more educated and question where their food is coming from and how it is labeled much more so than 10 or 20 years ago.” adds Benfer. At the Seafood Expo we also had the chance to discuss business with one of our strategic partners, One Source. “It was good to see Atradius at the show this year” says George Babeu of One Source. He also notes how the seafood industry has historically operated on thin margins, and how the sector as a whole has tighter constraints placed on it by government regulations. These forced constraints end up hurting especially the smaller businesses. To put things in perspective, Babeu offers the following example: “In Maine you can have 2 boats side by side – one from US and one from Canada – fishing for lobsters. The lobsters are coming from the same exact waters; the only exception is that one has blue claw protectors and the other has red. However, each government entity has their own set of rules as to what is acceptable to import into their respective countries”. In this environment of increasing risk for small businesses and strict government regulations, relying on Trade Credit Insurance can be a particularly important advantage. Tiziana Nitti-Payne, member of the Atradius Broker Gateway team, comments: “Being at the Seafood Expo North America was quite eye opening. We were rather impressed with the amount of people who knew about or even carried Trade Credit Insurance. The food industry is a key sector for Trade Credit Insurance, since more businesses every year feel the need to seek protection from insolvency or political risk linked to their buyer’s regions.